Evaluations of effect of forming structures and phase constituents on change of the most significant mechanical properties of welded joints were carried out based on investigation of peculiarities of formation of structural parameters in welded joints of high-strength steel, produced by different methods of fusion welding (laser, arc and hybrid laser-arc). A role of structural factors (alloying, phase constituents, grain, subgrain structure, distribution and density of dislocations, phase precipitations, their size and nature of distribution) was shown in providing the optimum properties of the welded joints and their service reliability. It is shown that the most significant structural-phase parameters and factors, providing under operation conditions, the necessary complex of properties of welded joints, namely strength (sy), fracture toughness (K1C) and crack resistance (tin), are fineness of grain and subgrain structures; dispersion of phase precipitations at their uniform distribution; absence of extended dislocation accumulations — potential concentrators of internal stresses (zone of nucleation and propagation of cracks). 23 Ref., 6 Figures. (1965) High-strength steel: Ed. by L.K. Gordienko. Moscow, Metallurgiya [in Russian]. Houdremont, E. (1959) Special steels. Moscow, Metallurgizdat [in Russian]. Shorshorov, M.Kh., Belov, V.V. (1972) Phase transformations and properties of steel in welding. Moscow, Nauka [in Russian]. Rozanski, M., Stano, S., Grajcar, A. (2016) Effect of braze welding parameters on the structure and mechanical properties of joints made of steel CPW 800. Pt 1: Arc braze welding. Ibid., 6, 6–12. Cah, P., Salminen, A., Martikainen, J. 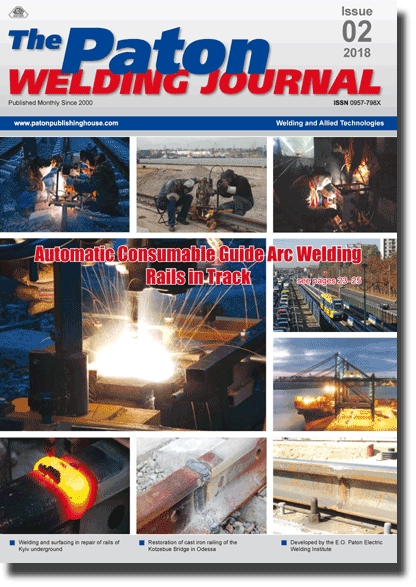 (2010) Laser-arc hybrid welding processes (Review). The Paton Welding J., 6, 32–40. Mikhoduj, L.I., Yushchenko, A.K., Poznyakov, V.D. et al. (1991) Weldability of high-strength steel 12GN3MFAYuDRSSh. Svarka, 11, 12–16 [in Russian]. Goldshtejn, M.I., Litvinov, V.S., Bronfin, B.M. (1986) Metallophysics of high-strength alloys. Moscow, Metallurgiya [in Russian]. Conrad, H. (1973) Model of strain strengthening for explanation of grain size effect on yielding of metal. Ultrafine grain in metals. Ed. by L.K. Gordienko. Moscow, Metallurgiya, 206–219 [in Russian]. Petch, N.J. (1953) The cleavage strength of polycrystalline. Iron and Steel Inst., 173, 25–28. Orowan, E. (1954) Dislocation in metals. New York, AIME. Busha, Yu., Karel, V., Longauer, C., Billy, I. (1977) About relation of yield strength of sorbite with medium size carbides. Fizika Metallov i Metallovedenie, 44(3), 604–610 [in Russian]. Romaniv, O.N. (1979) Fracture toughness of structural steels. Moscow, Metallurgiya [in Russian]. Stroh, A.N. (1954) The formation of cracks as a recoil of plastic flow. of the Roy. Soc. A, 223(1154), 404–415. Panin, V.E., Likhachev, V.A., Grinyaeva, Yu.V. (1985) Structural levels of deformation of solids. Siberian Depart., Nauka [in Russian].